What tracks has Yellowstone left on your soul? We met with a number of remarkable people during our time in Yellowstone. Park rangers, tour guides, wildlife photographers, and the owner of our favorite lunch stop all agreed that there is, indeed, something special about this place. And their answers to our question about what it is that makes Yellowstone special were quite similar. They valued the diversity that Yellowstone holds – wildlife, geysers, scenery; and that in its vastness there is always something new to learn. They appreciated the closeness of community and shared values that come with living in a small town centered on such a grand national treasure. And though none of them were natives to the area, all felt a sense of homecoming in their first experiences of Yellowstone and chose to make it their home. We, too, experienced something special in Yellowstone. But for us, whose home is North Carolina, perhaps the most important reflection is how our experience in Yellowstone affected us. Our snowcoach driver, Tamarak, talked about the tracks in the snow, the track of the Yellowstone hot spot across the west, and the track our country chose to take in preserving this place. And she asked us what tracks Yellowstone left on our souls. Below are some reflections from each of us on the answer to that question. Yellowstone speaks to each of us in a way that gives us a new perspective. 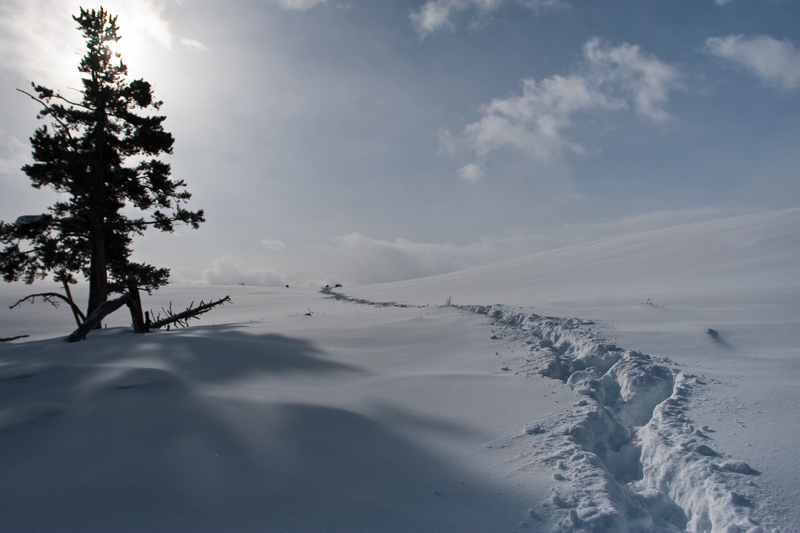 It was easy to follow the snowshoe tracks left by others and so, too, I hope my excitement for Yellowstone encourages others to visit and be forever changed. But when they come, I hope they also make their own snowshoe tracks and enter the territory of their soul uncharted by anything yet! It has made me recognize the serious task of sharing this land with others, so that it will remain wild into perpetuity. A feeling of gratitude blankets me in Yellowstone, and this deep appreciation will help me find my own tracks back to this immensely pure, whole and inspiring land. I’ve just let all the sights, sounds, and smells wash over me and I have no idea what will stick and sink in. So you’ll have to ask me again after I’ve visited Yellowstone again. I will say the locals who shared their knowledge and passion DID make a deep impression on me and I’ll think often about their words and dedication to one place. When I begin to hurry or feel stress, there is always a place in Yellowstone I can remember to soothe my soul. I hope to continue to visit Yellowstone to feel the magic and renew my soul. Much of the wildlife seemed to have a sense of simplicity to their lives, as well as patience, that most people (including myself) have long forgotten. Though this may be true, everything has a purpose with them. They have to work for this purpose. This has reaffirmed for me that I can’t just sit and wait for things to come my way! I have to be dedicated and use hard work to get me where I want to be in life. Yellowstone is unique. It reminded me of who I am and what is important to me. I felt the pulse of this place and I am forever changed because of it. It helped me see the best me. I have allowed the demands of daily life to etch deep tracks in to my soul. Slowly, one by one, you replace those deep tracks with layers of beauty and leave me with a feeling of peacefulness. As I snowshoed over the very tracks that the bison had walked, and looked around absorbing the breathtaking beauty of Yellowstone, I thought to myself: What must it be like to be a bison, to own nothing, yet have everything? I want to be more like the bison, roaming where I please and surrounding myself with unsurpassed beauty; worrying less about ‘things’ and just being with my herd of family and friends. But Yellowstone… what has it said to me? “Preserve me. Don’t let me get lost in the hustle and bustle of your life. Do not let me go. Don’t let me go.” I won’t. Yellowstone allows me to come into my own, to be my pure self, by demanding that I live in the present and absorb every moment. It has instilled in my soul a longing for wilderness and a deep connection with place, to be a part of the natural order of things. And by time and again demonstrating the transformative power of nature, it reaffirms my desire to share that power with others. Thank you all for helping make this an amazing career. It has been an incredible journey. I hope to see you again, looking at our world in awe, be it close to home or in the vastness of Lamar Valley. Yellowstone restored my soul and softened the thick skin of an unappreciated educator back in 2000. The museum introduced me to a world of like minded educators that had a passion for natural science education. It was the first of many trips with the Educators of Excellence which kept me excited about teaching science in the classroom. Mary Ann Brittan, Liz Baird, and Mike Dunn taught the teacher new ways of teaching through experiences that rippled through NC classrooms affecting thousands of students across the state. My last trip with the Museum was the inaugural Yellowstone in Winter trek in 2006. It was an incredible affirmation of teaching as having been the correct career choice for me. I am now retired and worry about the young educators still in the trenches. In a time of legislative underfunding and total lack of teacher support and renewal, the Museum still understands and continues their support. Thank you!